​Ukraine and the EU parliaments simultaneously ratified the economic and political parts of the Association Agreement that will strengthen ties between Kiev and Brussels. Economic integration is postponed until the end of 2015. The document was approved at 1:00pm in Kiev and there was a synchronous signing session in the European Parliament in Strasbourg. 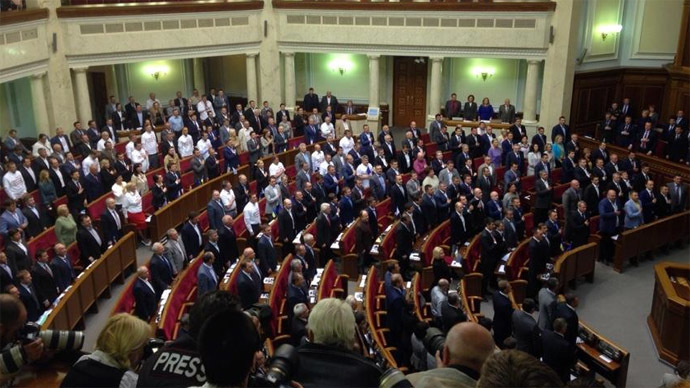 Ukraine’s Rada voted 355 votes in favor out of 381 total, and the European Parliament supported the ratification with 535 ‘yes’ votes and 127 against, with 26 abstaining. 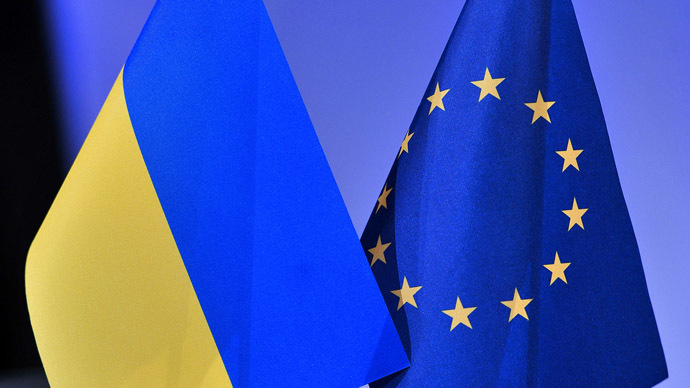 What is the Association Agreement between Ukraine and the EU? - Cooperate on several other issues: energy, industry, taxes, tourism, justice system, law, etc. “From tomorrow I task the government with approving the implementation of the agreement and immediately implementing it into the force of law,” President Petro Poroshenko said at the ratification in Kiev. Poroshenko said he hopes the agreement will help Ukraine reform its economy and fight corruption, and that someday Ukraine hopes to apply for EU membership. Ukraine "has embarked on the European path and nobody will are to shut the door to the EU membership for Ukraine," the President said, as quoted by ITAR-ITASS. Free trade with Europe’s $13 trillion economy will be postponed until January 2016, due to the weak state of Ukraine’s economy which would make it vulnerable to a sudden influx of European goods. Ukraine will continue duty-free trade with Russia and other CIS states until December 31, 2015, and on January 1, 2016 will begin economic integration with the EU. Ukraine will still have the benefit of sending exports to Europe under a preferential trade code, but duty- free trade will not come into effect until 2016, protecting both Kiev and Moscow from economic risk. In 2013, Ukraine exported goods worth $16 billion to Russia, nearly 25 percent of all total exports. 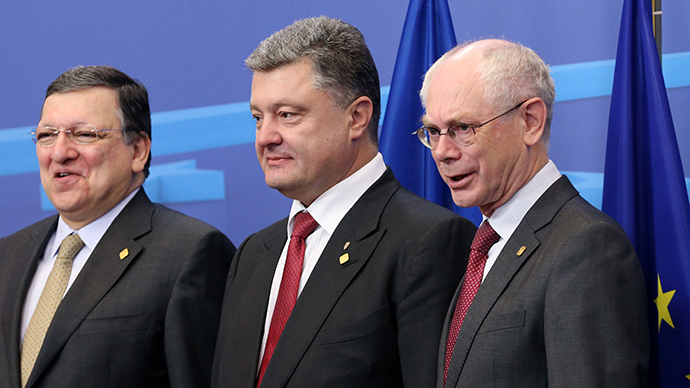 In comparison, Ukraine exported $17 billion to Europe in the same 12-month period. Since the political tension has intensified between the two, both have been cutting back on imports. In the first seven months of 2014, Russia reduced Ukrainian imports by 23.7 percent down to $6.7 billion, according to Russia’s Statistics Bureau. At the same time, Ukraine has been decreasing goods bought from Russia, which have fallen 20.7 percent to $9 billion. The lack of cooperative trade between the two has left a negative balance of trade of $2.3 billion. Russian President Vladimir Putin has estimated that nixing duty-free trade with Russia and switching over to the European system will cost Ukraine €165 billion over the next 10 years. During trilateral talks in Brussels on Friday, Ukraine, Russia, and the EU agreed Ukraine’s integration into Europe’s trade orbit will begin on January 1, 2016. Ukrainian President Petro Poroshenko signed the economic (the Deep and Comprehensive Free Trade Area, or DCFTA) part of the Association Agreement with the EU along with ex-Soviet nations Georgia and Moldova on June 27. Ukraine signed the political part of the agreement on March 21, shortly after Crimea rejoined Russia.